Publications are listed chronologically by tobacco topic. Gorilla A. The Importance of Smoking Cessation to Reducing Cardiovascular Disease Risk. Pharmacy Society of Wisconsin. 2018;32-38. Piper ME, Schlam TR, Fraser D, Oguss M, Cook JW. Implementing Factorial Experiments in Real-world Settings: Lessons Learned While Engineering an Optimized Smoking Cessation Treatment (Chapter). Optimization of behavioral, biobehavioral, and biomedical interventions: advanced topics (Book). Piper ME, Cook JW, Schlam TR, Smith SS, Bolt DM, Collins LM, Mermelstein RJ, Fiore MC, Baker TB. Timms KP, Rivera DE, Collins LM, Piper ME. System identification modeling of a smoking cessation intervention. IAFC meeting preprint. 2012. Fiore MC, Baker TB, Bailey WC, et al. (2008) A Clinical Practice Guidleine for Treating Tobacco Use and Dependence: 2008 Update. American Journal of Preventive Medicine. Fiore MC, Jaen CR. (2008) A Clinical Blueprint to Accelerate the Elimination of Tobacco Use. JAMA, 299 (17): 2083-2085. Fiore MC, Sims T, Theobald WE. (2006) Smoking cessation. In: Merck Manual, (Edition 18, pp. 2733-6). Whitehouse Station, NJ: Merck Research Laboratories. Fiore MC, Westman EC. (2004) Update on Smoking Cessation. Patient Care, Oct. : 34-42. Adsit R, Fraser D, Redmond L, Smith SS, Fiore MC. (2005) Changing Clinical Practice, Helping People Quit: The Wisconsin Cessation Outreach Model. Wisconsin Medical Journal, Vol. 104, No. 4: 32 – 36. [Full text]. Piper ME, Fox BJ, Fiore MC. (2001) Strategies for Smoking Cessation. Pulmonary and Clinical Care Update Online (CME Program). Lesson 13, Volume 15. Majeskie MR, Fiore MC, Baker TB. Quality In Quantity: In Support Of Consistent, Physician-Delivered Smoking Intervention. Tobacco Control. 1998;7(4):422-423. Mielke MM, Jorenby DE, Fiore MC. Achieving Smoking Cessation In Nicotine-Dependent Individuals: Practical Guidelines. CNS Drugs. 1997;8(1):12-20. Shi F-Y, Jorenby DE, Fiore MC. Recent Advances In Smoking and Smoking Cessation. In: Bone RC, Petty TL, eds. Year Book of Pulmonary Disease. St. Louis, MO: Mosby; 1996:67-73. Fiore MC, Shi F, Jorenby DE. Smoking and Smoking Cessation. In: Bone RC, Petty TL, Eds. Yearbook of Pulmonary Disease. St. Louis: Mosby; 1996:67-73. Harari PM, O’Connor NJ, Fiore MC, Kinsella TJ. Radiation Oncologists Can Assist Head and Neck Cancer Patients With Smoking Cessation. Int J Radiat Oncol Biol Phys. 1995;31(3):645-649. Lewis SF, Fiore MC. Smoking Cessation: What Works? What Doesn’t? J Respir Dis. 1995;16(5):497-510. Piasecki TM, Fiore MC. Smoking and Smoking Cessation. In: Bone RC, Petty TL, Eds. Yearbook of Pulmonary Disease. St. Louis: Mosby; 1995:105-110. Lewis SF, Fiore MC. Smoking and Smoking Cessation: Recent Advances In Tobacco Control Research and Smoking Cessation. In: Bone RC, Petty TL, eds. Yearbook of Pulmonary Disease. St. Louis: Mosby; 1994:93-97. Fiore MC, Lewis S. Smoking cessation. In: Love RR, ed. Manual of Clinical Oncology. 6th ed. Berlin: Springer-Verlag; 1994:101-113. Lewis SF, Fiore MC. Recent Advances In Smoking and Smoking Cessation: In: Bone RC, Petty TL, eds. Yearbook of Pulmonary Disease. St. Louis: Mosby; 1994. Fiore MC, Jorenby DE. (1992) Optimizing Nicotine-Dependence Treatment: A Role for Inpatient Programs. Mayo Clin Proc. 67(9):901-902. Fiore MC, Jorenby DE, Baker TB, Kenford SL. (1992) Tobacco Dependence and the Nicotine Patch. Clinical Guidelines for Effective Use. JAMA. 268(19):2687-2694. Baker TB, Fiore MC. (1992) Elvis is Alive, the Mafia Killed JFK, and Smoking is Good for You. PsycCRITIQUES.37(10):1014-1016. Brown BB, Theobald WE. How Peers Matter: A Research Synthesis Of Peer Influences On Adolescent Pregnancy. Peer Potential: Making The Most Of How Teens Influence Each Other. Washington, D.C: National Campaign to Prevent Teen Pregnancy; 1999. Oliveira Junior BL, Jardim JR, Nascimento OA, Souza GM, Baker TB, Santoro IL. Translation, Cross-Cultural Adaptation, and Reproducibility of the Brazilian Portuguese-language Version of the Wisconsin Smoking Withdrawal Scale. Jornal Brasileiro de Pneumologia. Nov-Dec 2012;38(6):716-723. Treat T, Bootzin R, Baker TB. (2007) Psychological Clinical Science: Recent Advances in Theory and Practice: Integrative Perspectives in Honor of Richard M. McFall. New York: Lawrence Erlbaum Assoc., 432 p.
Anderson JE, Fiore MC. Clinician Perseverance. Helping Patients Overcoming Tobacco Dependence. Wisconsin Medical Journal. 2001;100(3):14-15. Fiore MC, Jorenby DE, Piasecki TM, Baker TB. Management of Tobacco Addiction. Office on Smoking and Health, US Department of Human Services. (2000) (ch.4) 97-122. Jorenby DE, Fiore MC, Baker TB. Four Parameters of the Smoking Withdrawal Experience and Their Connections to Relapse: An Investigation Using Growth Curve Modeling. Nicotine and Tobacco Research. 2000; 303. Piasecki TM, Smith SS, Baker TB. The Tyranny of Habit and Availability. Addiction. 1999;94(3):341-343. Jorenby DE, Welsch SK. Energy Balance During Smoking Withdrawal. Nicotine and Tobacco Research.1999;1:94. Piasecki TM, Fiore MC. Putting Smokers In The Mood To Quit (Reply). Consultant. 1998;38(2):240-244. Nagotomo H, Jorenby DE, Fiore MC, Thet LA. Use of Exporated Sputum to Assess Bronchoaveolar Inflammation In the Lungs of Smokers. American Journal of Respiratory and Critical Care Medicine.1998;157:A505. Jorenby DE, Fiore MC. Is The Duration of Nicotine Withdrawal Shorter Among Light Smokers? Journal of Respiratory Disease. 1998;19:710. Hughes JR, Giovino GA, Klevens RM, Fiore MC. Assessing the Generalizability of Smoking Studies. Addiction.1997;92(4):469-472. Jorenby DE. Effects of Nicotine on the Central Nervous System. Hosp Prac. 1997(17-21). Wilk AI, Jorenby DE. Women and Substance Abuse. In: Ling FW, Laube DW, Nolan TE, Smith RP, Stovall RG, eds. Prim Care Gynecol. Baltimore, MD: Williams and Wilkins; 1996:347-355. Bjornson WM, Fiore MC, Logan-Morrison BA. The Growing Problem of Smoking by Women. Patient Care.1996;30(13):142-165. Smith GT, Goldman MS, Greenbaum PE, Christiansen BA. Expectancy for Social Facilitation from Drinking: the Divergent Paths of High-expectancy and Low-expectancy Adolescents. J Abnorm Psychol. Feb 1995;104(1):32-40. Gritz ER, Fiore MC, Henningfield JE. Smoking and Cancer. In: Murphy GP, Lawrence W, Lenhard RE, eds.American Cancer Society Textbook of Clinical Oncology. 2nd ed. Atlanta: American Cancer Society; 1995:146-163. Brandon TH, Piasecki T, Baker TB. Cue Exposure Treatment In Nicotine Dependence. In: Glautier S, Drummond DC, Remington B, Tiffany ST, eds. Addictive behaviour: Cue Exposure Theory and Practice. Oxford, England: John Wiley & Sons; 1995:211-227. Nelson DE, Emont SL, Brackbill RM, Cameron LL, Peddicord J, Fiore MC. Cigarette Smoking Prevalence By Occupation In the United States. A Comparison Between 1978 to 1980 and 1987 to 1990. J Occup Med.1994;36(5):516-525. Fiore MC, Shi FY, Heishman SJ, Henningfield JE. The Effect of Smoking and Smoking Withdrawal on Flight Performance: A 1994 Update. Report to the Centers For Disease Control and Prevention, National Center For Chronic Disease Prevention and Health Promotion, Office On Smoking And Health; 1994. Fiore MC, Gritz E. Nicotine addiction. In: Houston TP, ed. Tobacco Use: An American crisis. Washington, DC: American Medical Association; 1993:89-91. Fiore MC, Newcomb P, Mcbride P. Natural History and Epidemiology of Tobacco Use and Addiction. In: Orleans CT, Slade JD, Eds. Nicotine Addiction: Principles And Management. New York, NY US: Oxford University Press; 1993:89-104. Lewis SF, Fiore MC. A Practical Guide to The Nicotine Patch. Hosp Phys. 1993;29(11):12-23,29. Baker TB, Fiore MC. Eysenck Book Is Provocative, But Misleading. PsycCRITIQUES. 1993;38(7):759. Uhl GR, Persico AM, Smith SS. Current Excitement with D2 Dopamine Receptor Gene Alleles in Substance Abuse. Arch Gen Psychiatry. 1992;49(2):157-160. Persico AM, Vandenbergh DJ, Smith SS, Uhl GR. Dopamine Transporter Gene Polymorphisms Are Not Associated With Polysubstance Abuse. Biol Psychiatry. 1993;34(4):265-267. Smith SS, Newman JP, Evans A, et al. Comorbid Psychopathy Is Not Associated With Increased D2 Dopamine Receptor Taqi A or B Gene Marker Frequencies In Incarcerated Substance Abusers. Biol Psychiatry. 1993;33(11-12):845-848. Fiore MC, Schroeder LL. (2003) Effective Interventions for Patients Who Use Tobacco: Key Findings Fron the United States Public Health Service—Clinical Practice Guideline: Treating Use and Dependence. Clinical Psychiatry Monograph. 18 (1) PP. 64-73. Mielke MM, Jorenby DE, Fiore MC. Achieving Smoking Cessation In Nicotine-Dependent Individuals: Practical Guidelines. In: Palmer KJ, Ed. Smoking Cessation. Auckland, NZ: Adis International; 2000:1-10. Jorenby DE, Fiore MC. The Agency For Health Care Policy And Research Smoking Cessation Clinical Practice Guideline: Basics And Beyond. Primary Care. 1999;26(3):513-528. Smith SS, Jorenby DE, Fiore MC, Baker TB. Smoking Cessation: What’s New Since The AHCPR Guideline?Journal of Respiratory Disease. 1998;19(5):412-426. Fiore MC. The 3-minute solution for smoking cessation. Strategic Med. 1998;2(4):21-26. Fiore MC. Clinical Practice Guideline For Smoking Cessation (reply). JAMA. 1996;276(6):448. Fiore MC, Bailey WC, Cohen SJ. Smoking cessation: Clinical Practice Guideline No. 18. Rockville, MD: U.S. Department of Health and Human Services, Public Health Service, Agency for Health Care Policy and Research; 1996. Kottke TE, Solberg LI. Is It Not Time to Make Smoking a Vital Sign? (editorial). Mayo Clin Proc. 1995;70(33):303-304. Fiore MC, Jorenby DE, Baker TB. Treating Nicotine Dependence: Clinical Guidelines for the 1990s. J Smoking-Related Dis. 1994;5(Suppl. 1):157-161. Fiore MC, (Ed.). Cigarette Smoking: A Clinical Guide to Assessment and Treatment. Med Clin North Am.1992;76(2). Berg K, Smith SS, Piper ME, Fiore MC, Jorenby DE. Tobacco Treatment in Primary Care: Identifying Differences in Rates of Invitation to Participate. Wisconsin Medical Journal. 2018; 117(3):111-115 2018 PMCID: PMC6132262. Hudmon KS, Addleton RL, Vitale FM, Christiansen BA, Mejicano GC. Advancing Public Health Through Continuing Education of Health Care Professionals. Journal of Continuing Education in the Health Professions. 2011; 31(S1):S60-S66. Gonzales D, Jorenby DE, Tonstad S. (2006) Efficacy of Varenicline for Smoking Cessation, Letter of Reply: JAMA, Vol. 296, No. 21, 719-721. Fiore MC. Using Pharmacotherapy for Smoking Cessation. Patient Care. 2001 Dec 30;35(24):18-27. Hughes JR, Lesmes GR, Hatsukami DK, Richmond, RL, Lichtenstein E, Jorenby DE, Broughton JO, Fortmann SP, Leischow SJ, Mckenna JP, Rennard SI, Wadland WC, Heatley SA. Are Higher Doses of Nicotine Replacement More Effective for Smoking Cessation? Nicotine and Tobacco Research. 1999;1(2):169-174. Lewis SF, Fiore MC. Nicotine Replacement Therapy: Is Pregnancy a Contraindication? J Respir Dis.1994;15(1):15-16. Fiore MC, Hartman MJ. Side Effects of Nicotine Patches. JAMA. 1993;270(22):2735. Fiore MC, Jorenby DE. Transdermal Nicotine – Clarifications, Side Effects, and Funding – Reply. JAMA.1993;269:1940-1941. Jorenby DE, Fiore MC. The Nicotine Patch: Reality and Potential. The Counselor. 1992;10:16-20. Baker TB, Fiore MC. Polishing the Brass While the Ship Goes Down. PsycCRITIQUES. 1993;38(7):759. Schensky AE, Smith SS, Icenogle DL, Fiore MC. Youth Tobacco Sale Compliance Checks: Impact On Vendor Practices and Community Policy. WM J. 1996;95(11):775-778. Researchers Drs. 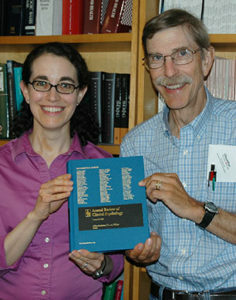 Tanya Schlam and Tim Baker display a copy of the Annual Review of Clinical Psychology, which included their article.